The open seas had been a subject of myths and legends since the beginning of seafaring. Mariners of the ancient times made animal sacrifices to Neptune to please him, asking for protection from the monsters and storms. Meanwhile 15th Century explorers pondered what lay beyond Northwest Africa, at the same time both looking for something to ease their fear of falling off the edge of the world as well as tokens to display their maritime achievements. Somewhere along the line, the line crossing ceremony was born. When a sailor crossed the equator for the first time, sailors who had previously crossed the equator tested them for their capability to endure the long voyages, and at the end of the ceremony inducted them into a fraternity of seasoned sailors. Since then, other similar ceremonies were conducted when other lines such as the Arctic Circle or the International Date Line were crossed by sailors for the first time. The tradition of the line crossing ceremony lived on into the WW2 era, and for many navies in the world at the time, it constituted a rite of passage for sailors. In the British Royal Navy and the United States Navy, for example, Pollywogs who had not yet crossed the line transformed into Shellbacks with the ceremony, entering a brotherhood of trusty sailors. The ceremony traditionally was presided over by a Shellback dressed as King Neptune, ruler of the high seas; other Shellbacks might dress as the king's court. As popularly known, the ceremony involved the embarrassment of Pollywogs for the entertainment of Shellbacks. Pollywogs often had to run through a gauntlet of various obstacles, then swear loyalty to King Neptune by kissing his signet ring and/or his bare foot. In late Nov 1936, when American cruiser USS Indianapolis crossed the Equator with President Franklin Roosevelt aboard, even the leader of a nation was not subject to exemption. 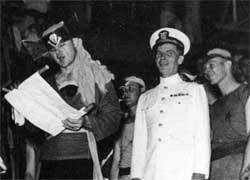 Roosevelt was made to plead his case before a seasoned sailor who dressed up as King Neptune, and had to go through some degree of embarrassment before he was granted the status of a Shellback. Like most sailors who went through this rite of passage, Roosevelt was given a certificate to show his status as a trusty Shellback. Now the Commander in Chief of the Army and Navy, to appear before the Royal High Court and our August Presence on the aforesaid date at such time as may best suit OUR pleasure under penalty of eternal pickling. CHARGE 1. Disregard of the traditions of the sea. Specification: In that Franklin D. Roosevelt, having, for many years sailed the high seas and bounding main, entirely through kindly assistance, toleration and consideration of his Majesty Neptunus Rex, has, for lo these many years, failed to appear in person to show allegiance to his Royal Highness, thereby masquerading as a man of the sea, and by this utter disregard added insult to other previous crimes. CHARGE 2. Taking liberties with the piscatorial subjects of His Majesty Neptunus Rex. Specification: In that, Franklin D. Roosevelt, having taken liberties with the denizens of the Realm of Neptunus Rex, by maliciously removing them from the depths of their recognized habitat, has permitted these acts to be publicized by print, town crier, and all other means of shameless publication; and, furthermore, has exaggerated this crime by the public humiliation of the greatest of these creatures of the sea, by stuffing them full of sawdust, and placing them in a position of eternal disgrace in a national museum where the eyes of all mortals may regard their pitiful and ignoble plight. "On the day we crossed the equator, all the men, fully armed and equipped, assembled on deck. 'At this time, when we are about to... advance into the southern hemisphere, we shall pay our respect toward the Imperial Palace,' said the commander toward his assembled subordinates. Solemnly, and with overflowing emotions, the men presented arms toward the north." You've got to understand why this is done. It's all navy tradition, sure, but all we had was each other. There was no liberty, we weren't going ashore, and no one was going to see you. Your hair was going to grow back; the grease and paint will come off, and things will turn back to normal. After it was over, we grew closer and it tightened up the crew. For me it's a fond memory and all part of being in the navy. In 1995, the line crossing ceremony aboard an Australian submarine was deemed as sexual assault upon the uninitiated, and the news came before public scrutiny. Navies of the world began curtailing or banning the ceremony in the 1980s. There were other similar ceremonies. For instance, the Dragon Ball sometimes took place on the return trip across the Equator. When sailors cross other major lines or landmarks, such as the Arctic Circle, International Date Line, or the Panama Canal, similar ceremonies were sometimes held. For many veterans of different navies, their recollections of the line crossing ceremony remain one of the most memorable experiences in their careers. Sources: Inferno, United States Navy Naval Historical Center, Wikipedia. 20 May 1936 USS Portland crossed the equator while on maneuvers with the rest of the Pacific Fleet, prompting Crossing the Line ceremonies on at least 102 ships. USS G. M. L. Hersey crossing the line in 1944 Going to the islands to drop sailors off to build Hollandia New Guinea. Also building Mandus and Los Negros . WHAT date is the line crossing. No ship books open to people to see. Shellback cards not given to all. When were the crossing dates to the islands at war time 1944 to 1946 ? From a journal of one of the LST 740's radioman, Earl L. Roper -USNR- July 5 - Crossed equator. Us pollywogs (the one’s that had not been across the equator before) got initiated into the order of the shellbacks by King Neptune and Davey Jones and his band. We flew the Jolly Roger all the time we were being initiated. First we had to strip to our shorts and then they sprayed us with sea water and we went and knelt down before King Neptune and they blindfolded us and gave us so many licks with a paddle and then they took us in another partition and gave us castor oil and painted us every color you could think of and cut our hair every which a way. We were sure funny looking sights. We had a lot of fun though after getting initiated watching others get it. After my dad died, we found his Domain of Neptunus Rex card among his belongings - it is dated: 22nd day of August 1944 (aboard the U.S.S. Leon). My dad talks about crossing the equator on the USS Newberry on his 18th birthday, 1945. One of the rituals he endured was: he was put into a barbers chair, his head was shaved, and he was tipped back into a tub of drain oil. At 84 years young, he laughs about it. I found a certificate for my grandpa's crossing from WWII. Wish he were still alive so I can ask him about it. looking for anyone who knows when the USS Baltimore may have crossed the equator in "44". I found a certificate among his belongings. I recently found my fathers certificate from the USSLST-688. It is dated August 23, 1944. I would appreciate any information anyone has. His name was Robert Thompson. I have found a Neptunus Rex form for my step-father Thomas Norman Bromfield. Its dated 12th April 1943 on the HMS Striker bound for Balboa. I am totally confused as I can't seem to find any verification of this. Does anyone remember him as he was in the Russian Convoy. Some autographs have comments on calling him Stripes or Stripes the rum rat. Any info would be much appreciated. I have my dad's certificate from crossing on January 17, 1944 on the USS Azalea City bound south on a secret mission of war. My Dad was on the USS Erie. He is very proud of his Navy years. I had his certificate and then gave it to my nephew. He is 92 and doing fine. I have my fathers certificate Domain of Neptunes Rex Dated Aug 30 1943, any information would be appreciated. We purchased some old photographs at an auction. In a USN cruise albulm we found wonderful pictures of James Melton Henry (killed June 20, 1948) and Clifford Neal Gilham (killed May 28, 1945), along with all of their Navy buddies. We would love to return these to the family. If anyone has any information please let me know. The albulm was made by someone named "Peg". I have my Dad's Neptune Certificate from Oct, 1944. He was on the Thetis Bay in the South Pacific. Crossed the line on November 30,1966. USS Eugene A. Greene (DD-711).Initiated, and injured leg crawling on non-skid. Spent 5 days in rack ,on back filled with anti-biotics until healed. I have two wallet sized cards that belonged to my uncle who served in the USMC during WWII. The first is Neptunus Rex... dated 1-22-44 on the USS Robert C Harper... longitude 175-05w. The second was Domain Of The Golden Dragon for crossing the 180th Meridian into the "Far East" by air on a CENCATS flight... latitude was "secret", presumably not to identify CENCATS routes should the card be captured. That card is dated 2-8-44. My father crossed over April 23, 1942 the U.S.S McCawley at Longitude 95-40W. I'm trying to figure out how to spot this on Google Earth. My father was Richard C. Payne, USMC, 1st Marine Division. This would have been on his way a Dauntless Dive Bomber at Guadalcanal. Any help is apprecicated. George: In the Google Earth search window, type: 0N, 95 40W [no dash], click Search and you will fly to the spot. This spot is in the Pacific just west of the Galapagos. Domain of Neptunus Rex month of Sept.1944 in latitude 0000 there appeared in Our Royal Domain the S.S.MATSONIA.Be it known by all Sailors Marines,Landlubbers and others that :Tec 5 Donald M.Hensel was found worthy to be numbered as One of Our Trusty Shellbacks. Was the Azelea City mentioned in line 15 the second Azealea City. On Line 27 I see someone is talking about the second Azalea City. Was there 2 of them? There were indeed two ships named Azalea City in WWII. Both were merchant ships, not Navy ships, so 'SS Azalea City' would be more proper than 'USS Azalea City.' The first was a freighter sunk Feb 1942 by U-432 off the US east coast. The second was a troop ship that carried troops to Guadalcanal in Jan 1944. Hi, I wrote 1st here about my father in 2009. He has since died but just yesterday I found his Shellback Certificate. My grandmother placed it behind an old print. I was looking behind old prints and found it . September 14, 1944 bound for SW for south west and WAR ZONE . The LONGITUDE says only 1 word SECRET !! I was so shocked to find this. It was in a garage I plan to have demolished and rebuilt. So its like gold to me . A final gift from my father and grandmother to show they do care. But if anyone onows of this crossing I am momtina8888@yahoo.com . I am so glad to hear your stories of people we all loved andd who gave so much . It warms my heart THANK YOU ALL !!! Tina: The War Diaries for USS General M.L. Hersey are not very clear. Lat/Longs were not listed, as did most War Diaries, so the Longitude of the line crossing is not included. Interestingly, the War Diary skips the date of 16 Sep 1944 and moves from time zone plus-10.5 to minus-13 [sic] which means they were crossing the International Date Line – the Domain of the Golden Dragon. If your Shellback Certificate is dated 14 Sep 1944, then they narrowly missed the chance to cross both lines at once which would have bestowed upon them the very rare title of Golden Shellback. I wrote here 1st in Oct 28, 2009 now Nov 4, 2015 a lot has changed. My father passed. His SHELLBACK certificate that has been missing for 70 years has been found by me !! My grandmother was born 1899 and Grandma Mary had folded the top and bottom edges and placed the certificate behind an old print . Grandma had gone to a nursing home and years later died. Her house was cleared out . My Dad had many things in his garage stored for close to 20 years. When he died my sister was power of attorney. The property was inherited by me but my sister , neice and family took a lot. They went all threw the garage took every thing they wanted 2 years ago. Well I have to rebuild garage and staarted to look and all of a sudden I remembered my grandma hid many things. I looked behind each picture and WOW I found the Shellback certificate !! says WAR ZONE and Longitude SECRET !! it's in beautiful shape I know know it will be next to my son Jon Whitehairs Shellback certificate. My grandmother and father and mom show me in all sorts of ways I am LOVED each day. Oh we won't mention the gold ;) thats another story . See it pays to be good and just be there for parents as they get old. Dad when he had his stroke only could remember my phone number because of all his 4 girls in nursing (Resp therapy, LPN and RN) . It was me the little Nurse Aid who called each day. When his phone was off the hook my husband and I went 20 miles to make sure he was fine . I hope to hear more threads from you all on good things you learn. I will say a prayer for each of the military both living and lost . BUT ALWAYS in OUR HEARTS !! This doesn't show Golden Shellback BUT it's heaven to me ho matter what. And the fact it ended up with just the right daughter after everyone else took all they wanted just makes it so much sweeter. My son Jon was Navy number 2 Instructor of the Year in 2010 . He was Sailor of the Year 2008 , Sailor of the Quarter many times as a STEG Sonar Tech. the only grandchild to go Navy. So you see it's special my son will have this and he and Dad became great friends as well :). It is so COOL Dad was so close to a Golden Shellback he was just 18 and turned 19 on the Island Dec 26. He built many bases in Plesington but his boot camp was as a Carpenters Mate building SAMPSON Base in our home state of NY. dDad was NOT A CB !! But a real Carpenters Mate . Sampson has photos in the museum and online of the 1st winter. MY DAD WAS THERE !!! There were no boot camp photos and no boats at the camp yet. Dad was in the building by the lake on the left side of camp. befor going to Great Lakes. He had meny adventures. Like learning to drive on the islands and Lake Sentani neat Hollandia the Air Force fixed there planes and took sailors up on test flights . Dad said Japanese planes were all over the trees where they crashed. He was there after the war and a lot got dumped in the waters off the coast befor going home on the Uss Half Moon. When he got ther he always remembered Melody Bay but it was Milne Bay so he was very close in remembering . THANK YOU FOR ALL YOUR HELP !! !I want to help others over there and family in some way :) . After loosing my father, I found his Neptunus Rex and Golden Dragon certificates. Both are dated April, 1945 with the Golden Dragon showing April 17th. Both were from the USS S.D. Sturgis. The Dragon was signed by John Barr and the Rex by Clark, D.A. (USN). Does anyone have any information they can share with me. My father died at 87 years old and never spoke about his time in the service. He was with the Tropic Lightning Division, specifically the Wolfhounds and landed at Luzon. After that campaign he was shipped to Yokohama. Anything and everything would be appreciated. My dad, Conrad Nagengast, entered the Navy on January 7, 1936. 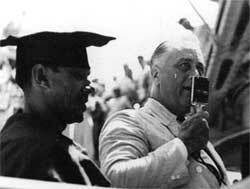 In November of that year he was on the USS Indianapolis for President Roosevelt's Good Neighbor tour to South America. We still have my dad's Neptune certificate signed by Roosevelt as his shellback initiation. My dad remained on the Indy for at least the next 6 years. The ship was 4 days out of Pear Harbor when it was bombed. He has told us what it felt like to return to that devastation a few days after the bombing. His second Neptune certificate, also while stationed on the Indy, is dated February 1942 only 2 months later. Fortunately as a seasoned sailor, needed for the new ships for the war in the Pacific, my dad was transferred to a different ship, survived WWI and Korea and retired in 1956 after 20 years of service. Typo in my comment #32: my dad survived WWII. The Indy returned to Pearl a few days after Pearl was bombed. He had transferred off of the Indy by the time she was torpedoed and sank. I just picked up a certificate from an estate sale dated March 6th 1945 from the USS Major. My son is a recent shellback so I thought he might like the history of it. If anyone has any more information it would be great. I know the major witnessed the Japanese surrender on Sept. 2, 1945. My question is: Are the certificates standardized? If not, where are they designed and printed? Is there a way to tell which ship the initiates were on? My Uncle passed 10 years ago. He gage me a framed document of 'Rulers of the Raging Man. on the back were the signatures of approximately 80 service members with their (then) addresses. Dater January 28, 1944... any interest out there.